Small Lunch with bag ideal for carrying a small meal. It accommodates a variety of lunch favorites. and includes a set of one large lunch box and one small lunch box. Carry salad or vegetables in the small bowl and curry, rice, rotis, or curd in the larger bowl. Excellent pick!! Junior Executive Lunch Set consists of 1 Large Bowl and 1 Small Bowl. Four bowls allow you to pack a complete lunch. It has a classic round seal which makes it air tight as well as liquid tight and prevents spillage of curries. It’s sheer base helps in identifying contents easily. It is stack able thus saves space. Its Smart Bag separate your cool and warm food in separate compartments. Four Bowls with compartments allows you to pack a complete lunch. Two deep bowls and two flat bowls allow you to pack a complete lunch with a healthy variety. Carry salad and vegetables in the small bowls and curry, rice, rotis and curd in the larger bowls. Carry vegetarian and non-vegetarian dishes separately. 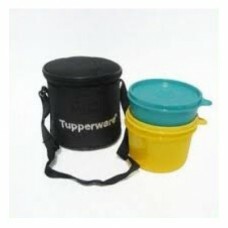 Carry your cool and warm food in separate compartments as per their requirement. 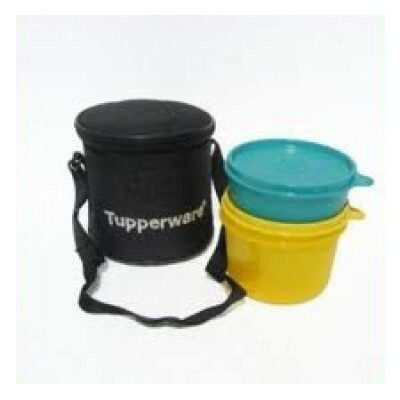 Avail this Tupperware Executive Lunch Box offer and eat fresh home cooked food everyday.